(CNSNews.com) - The federal government spent $1,822,712,000,000 in the first five months of fiscal 2019, the most it has spent in the first five months of any fiscal year since 2009, which was the fiscal year that outgoing President George W. Bush signed a $700-billion law to bailout the banking industry and incoming President Barack Obama signed a $787-billion law to stimulate an economy then in recession. At the same time that federal spending was hitting this ten-year high, federal tax revenues in the first five months of the fiscal year were hitting a four-year low of $1,278,482,000,000. According to the Monthly Treasury Statement for February, the Treasury spent $1,822,712,000,000 in the five months from October 2018 through February 2019, the first five months of the federal fiscal year. The last time the Treasury spent more than that in the first five months of a fiscal year—in inflation-adjusted constant February 2019 dollars—was fiscal 2009. That year, the Treasury spent $1,936,268,470,000. Fiscal 2009 started with President Bush signing the Troubled Asset Relief Program into law on Oct. 3, 2008; it continued with President Obama, after his January inaugural, signing the American Recovery and Reinvestment Act on Feb. 17, 2009. 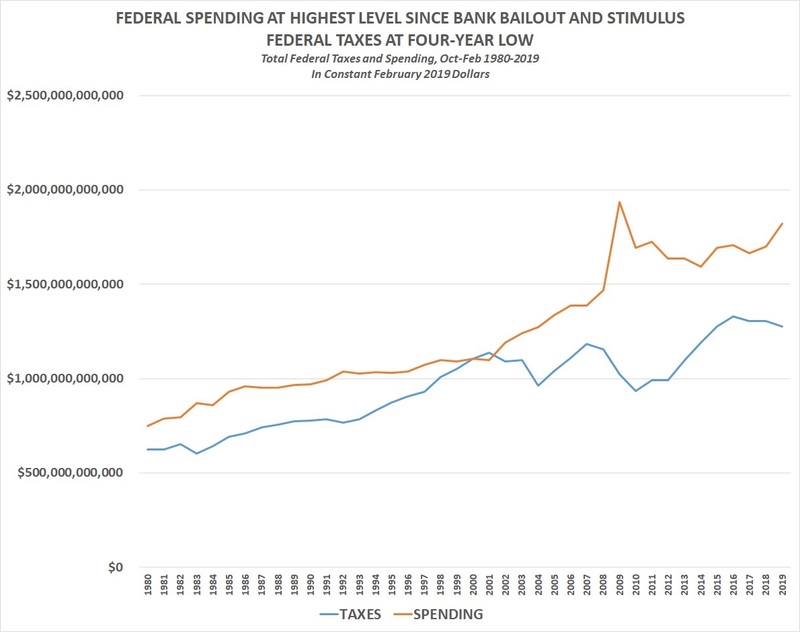 At the time, the Bush bank bailout and Obama stimulus were perceived as the two of the biggest emergency spending bills in the nation’s history. “With evidence mounting that the nation faces a sharp economic downturn, Congress yesterday gave final approval to what may be the biggest government bailout in American history, authorizing the Bush administration to spend $700 billion to try to thaw frozen credit markets and prevent a deep recession,” the Washington Post reported when Bush signed the bank bailout. The reporting on Obama’s stimulus was similar. “Warning that its passage into law ‘does not mark the end of our economic troubles,' President Obama on Tuesday signed the $787 billion stimulus package, a measure he called the most sweeping financial legislation enacted in the nation's history,” the Washington Post reported on Feb. 17, 2009. 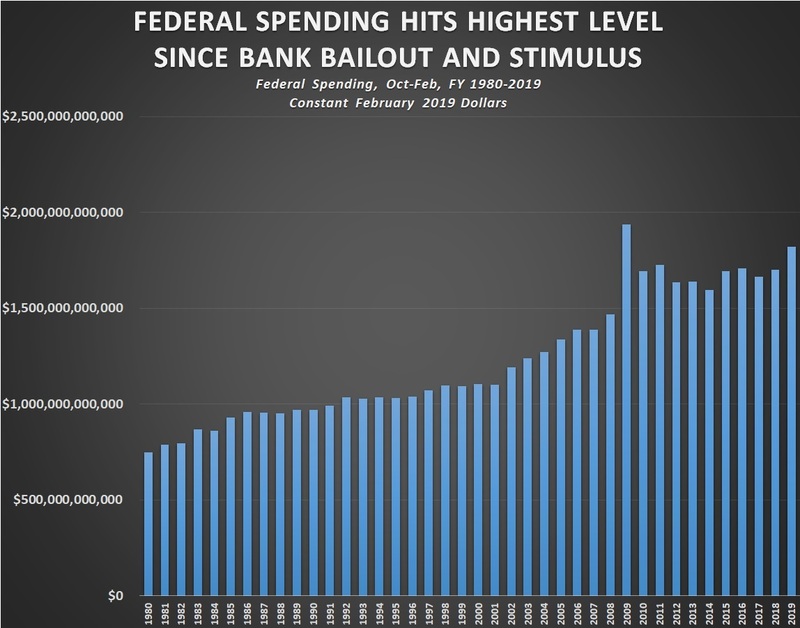 After federal spending hit an all-time high of $1,936,268,470,000 (in constant February 2019 dollars) in the first five months of fiscal 2009, it eventually dropped to $1,595,941,280,000 in the first five months of fiscal 2014. That was the lowest level for the first five months of any fiscal year in the last ten. Federal spending climbed from $1,702,631,750,000 (in constant February 2019 dollars) in the first five months of fiscal 2018 to $1,822,712,000,000 in the first five months of fiscal 2019. While spending has gone up this year, federal tax receipts have declined. Total federal tax revenues through February dropped from $1,305,723,550,000 (in constant February 2019 dollars) in fiscal 2018 to $1,278,482,000,000 this year. 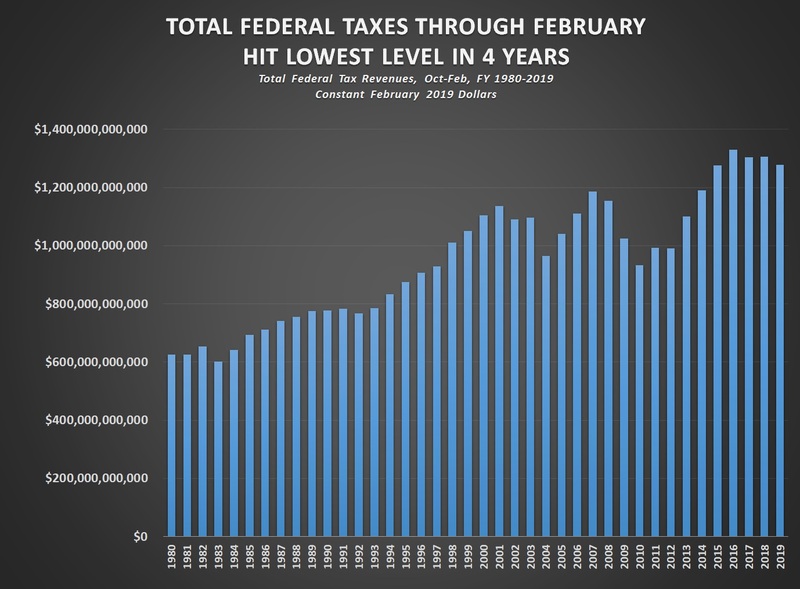 The last time, total federal tax revenues were lower through February than they were this year was fiscal 2015, when they were $1,276,806,230,000 (in constant February 2019 dollars). Standing alone, individual income tax receipts also hit a four-year low of $626,592,000,000. 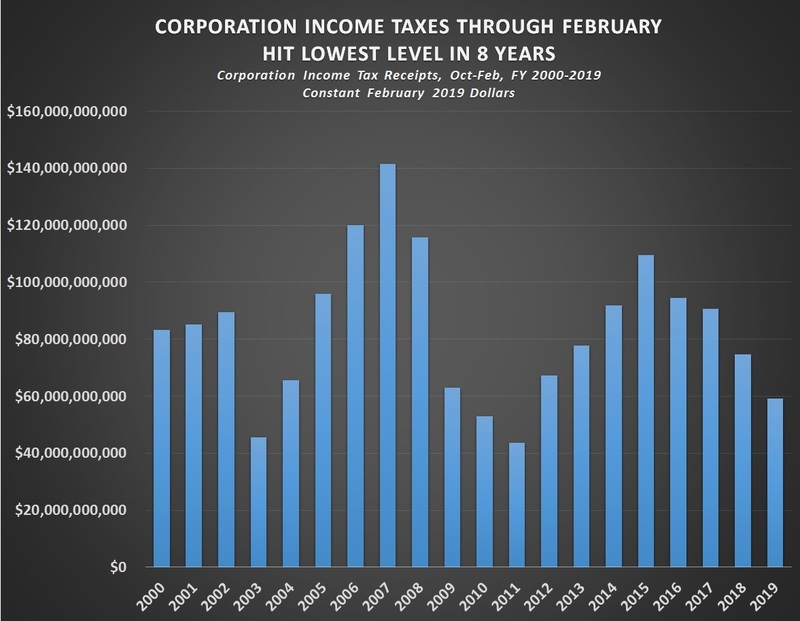 Corporation income taxes through February hit their lowest level in eight years--$59,194,000,000. That was down from $74,658,920,000 through February in fiscal 2018. 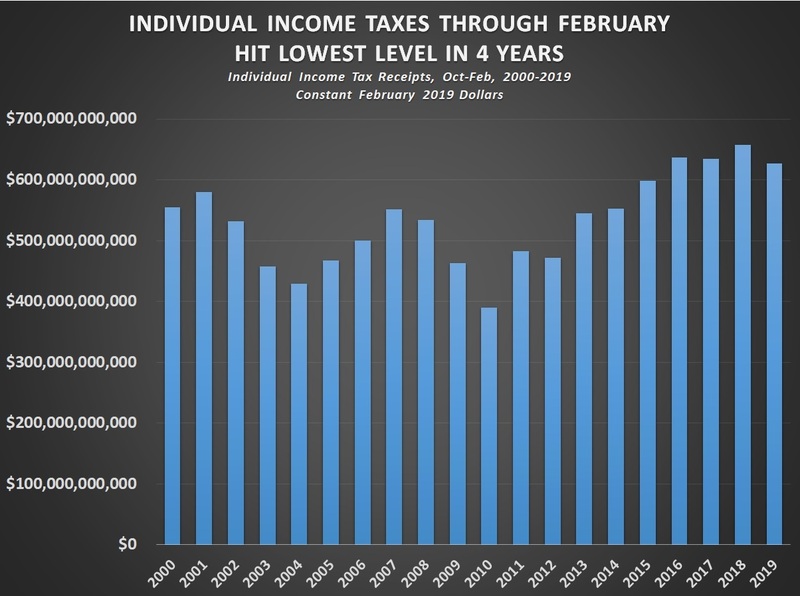 The last time federal corporation income taxes were lower through February than they were this year was fiscal 2011, when they were $43,607,510,000 (in constant February 2019 dollars). In the month of February alone, corporations paid a net negative in federal income taxes, according to the Monthly Treasury Statement. During the month, according to the statement, corporations paid a net negative of $669,000,000 in income taxes. 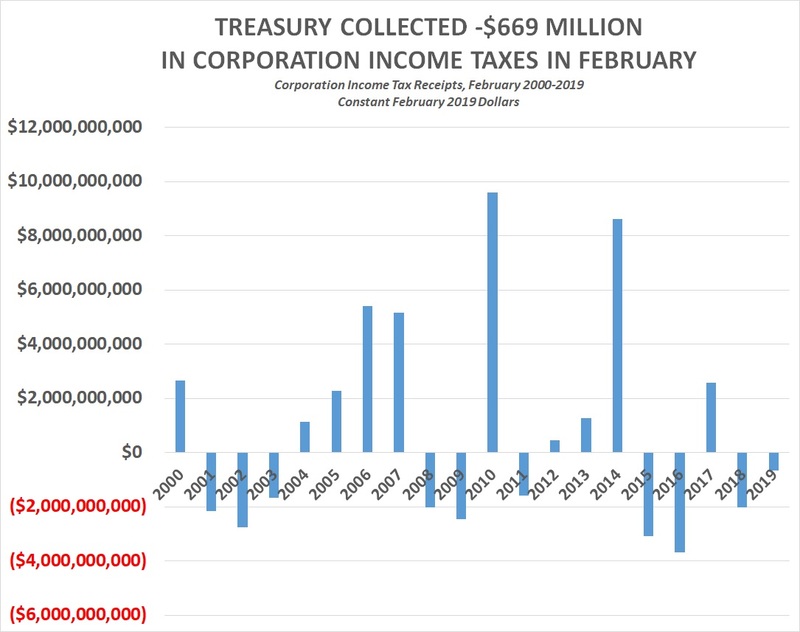 It is not unusual for corporations to pay a net negative in income taxes in the month of February, according to historical data from the Monthly Treasury Statements. In the last 20 fiscal years (2000 through 2019), corporations have paid net negative income taxes in 10 Februaries (2001, 2002, 2003, 2008, 2009, 2011, 2015, 2016, 2018, 2019). In fact, the net negative $669 million in income taxes paid by corporations this February was less than the net negative income taxes paid by corporations in any of the other nine years over the past 20 that corporations paid net negative income taxes. The highest level of net negative income taxes paid by corporations over the past 20 years occurred in fiscal 2016, when corporations paid a net negative $3,685,390,000 in income taxes (in constant February 2019 dollars). Asked about the decline in corporation income tax revenues, a senior Treasury Department official told CNSNews.com that the Tax Cuts and Jobs Act signed by President Trump in December 2017 was understood to be frontloaded in that corporations early on would take advantage of the new expensing rules to build their businesses.